Named for Big Brook, which drains into the Swimming River Reservoir, this park contains young wetland and maturing American beech, white oak, tulip poplar and hickory trees as well as fields of grasses, goldenrod and other perennials that provide habitat for butterflies, birds and other wildlife. 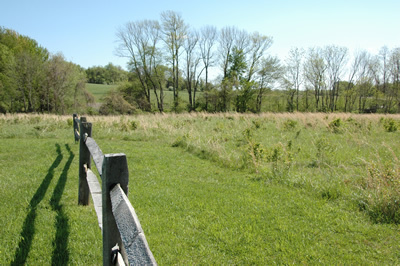 Its rolling hills and open meadows make the park a popular destination for hikers, cyclists and wildlife enthusiasts. The park offers ideal access to the southern extension of the Henry Hudson Trail. A number of projects are in the works to make the site more suitable for hosting activities and summer camps. The outdoor swimming pool was renovated in 2018. The pool will be available for use by Park System summer camps as well as community groups participating in our Recreation Assistance Program (RAP). There are no immediate plans to open the pool for swim lessons or open swim. The original 432 acre parcel of land that established Big Brook Park was formerly used as farmland for patients at the Marlboro Psychiatric Hospital, located across the street (Route 520). The Park System purchased this property—which once contained a piggery, dairy farm and other agricultural operations—from the state in 1997, around the time the hospital closed. The park was also home to the former YMCA Camp Arrowhead. Visitors are welcome to hunt for fossils in Big Brook. Access is from the Boundary Road parking lot. Rules governing fossil hunting and collecting are listed here. See our Supplemental Rules Governing the Hunting and Collecting of Fossils at Big Brook Park.